Who Solves The Mystery Of The Great Pyramid Building ? Who Solves The Mystery Of The Great Pyramid Building: Hasan Sayid Ahmad Or Jean-Pierre Houdin ? Hasan Sayid Ahmad the author of the original theory about the Great Pyramid building officially registred in Egypt from years. 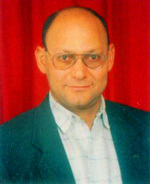 The first radical theory on this topic was presented by Hasan Sayid Ahmad, an Egyptian, more than ten years ago. In his theory Mr. Ahmad surmised that lifting the stone blocks was achieved through the ascending passage inside the pyramid itself. Accordingly, he considers this passage constituted an internal ramp. The stone blocks were raised up by using semi-mechanical machines (resembling "elevators"), invented by the ancient Egyptians for the purpose. Mr. Ahmad paid considerable attention to one of them that worked in the ascending passage and in the Grand Gallery. This 'elevator' system consisted of two wooden sledges attached to a complicated system of ropes, one of them in the descending passage (the lower sledge) and the second in the ascending passage and the grand gallery (the upper sledge). Only a few people controlled the movements of this machine (see diagram). The downward slide of the lower sledge pulled up the upper one, while the downward slide of the upper sledge pulled up the lower one. Mr. Ahmad concluded that the machine was used first to lift the 2,300,000 stone blocks representing all the blocks of the Great Pyramid, and later on it was used to move what remained inside the pyramid . To demonstrate his theory Mr. Ahmad designed a complicated model showing the workings of such a machine and described each part in detail. This hypothesis supposes that the pyramid was built using the internal ramp of the ascending passage. Accordingly, after the first few rows of stone blocks, the ancient Egyptians started to transport the blocks via the ascending passage, which functioned as an internal ramp. Mr. Ahmad thinks that the ascending passage was wider during the work years to allow the stone blocks to be moved more easily. He adds that there was no other purpose for the descending and ascending passages, judging from their shape and size, and does not think they could have been used as normal passages. To support his view he called attention to their smooth surfaces which prevent people from moving through them easily. Mr. Ahmad stated that there was a second similar system of sledges inside the pyramid, starting from the upper end of the Grand Gallery, giving no further detail. To document his discoveries he sent copies of his new theory to the authorities in Cairo, along with many drawings illustrating each part of the sledge system including the ropes . However, Mr. Ahmad's theory was reinforced after the French architect Jean-Pierre Houdin claimed that the pyramid had been built from the inside out, calling attention to an internal spiral ramp used to raise the stones of the Great Pyramid. Mr. Houdin's new theory was generally accepted by most Egyptologists. Bob Brier considered it more valid than other theories . Mr. Houdin had no doubt studied Mr. Ahmad's theory, but made no reference to it in his publications. However, these words in Mr. Houdin's report  indicate that he studied had studied Mr. Ahmad's report: "The Grand Gallery inside the pyramid, another source of mystery for Egyptologists, housed a giant counter-weight used to hoist five 60-ton granite beams into position above the King's Chamber." Al Balad Newspaper, N°. 24, page 25, April 24, 2000, "Egyptian Researcher indicates the presence of elevator inside Kufo pyramid" (in Arabic). 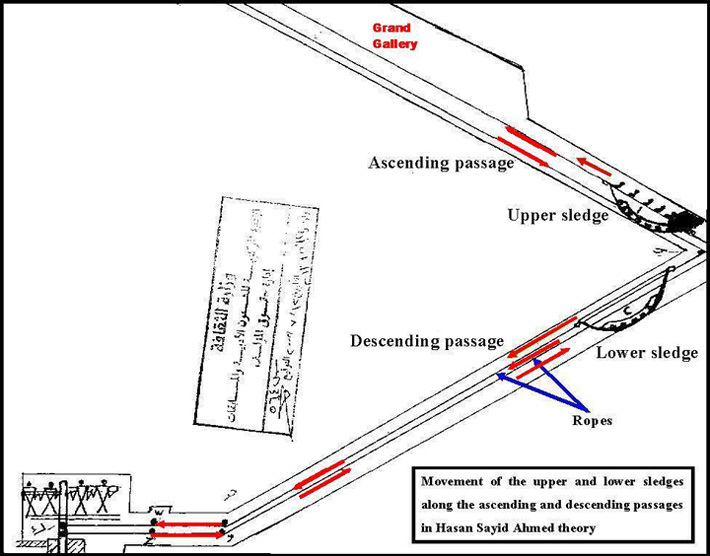 Sketch showing the movements of the upper and lower sledges in the ascending and descending passages in the Great Pyramid. Stamp of the Ministry of Culture, intellectual property, 14 July 2000.